In many applications, Command-P is used to print. My fingers are accustomed to emacs settings and reflexively press Command-P not for printing but for browsing history. It's annoying to see the print pop-up window every time when I press Command-P. I don't need a shortcut to print. How do you block a shortcut globally? This can be achieved by remapping the Print shortcut to a different shortcut that is out of the way, unused and unlikely to be pressed. Open System Preferences → Keyboard → Shortcuts → App Shortcuts. Click + to add a new shortcut. Keyboard Shortcut: Set it to something out of the way. 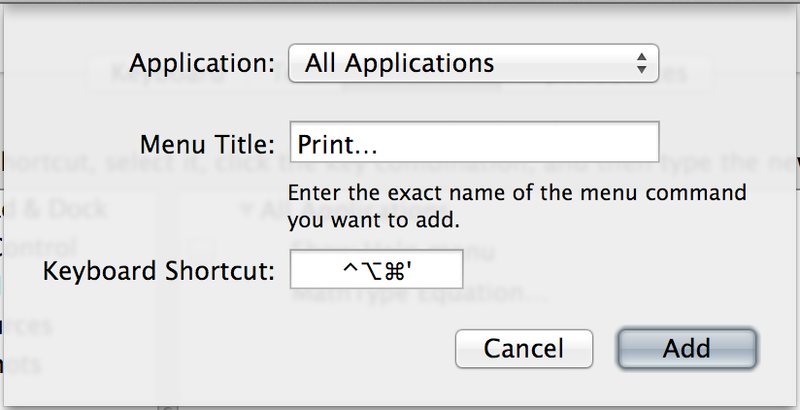 Now, the Print command is set to a random keyboard shortcut, freeing up ⌘P. nil would be triggered when pressing n in some applications like Audacity and \0 would be triggered when pressing any key in Safari in 10.9. Does anyone know how to disable unicode text input in text fields?